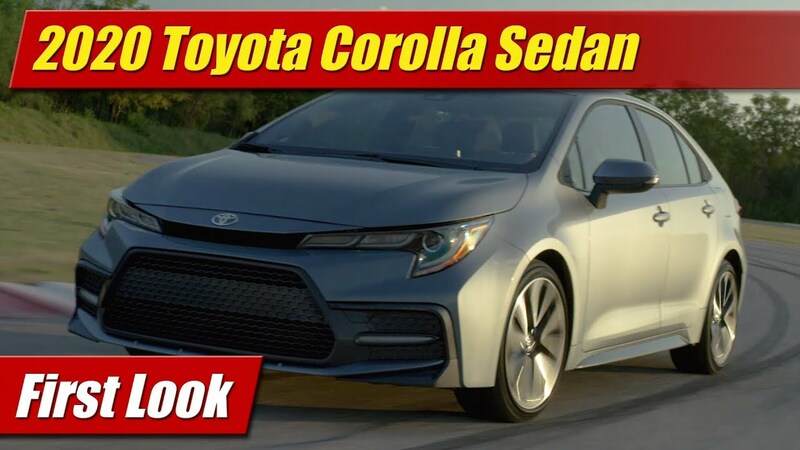 Replacing the current Toyota Corolla iM which still sported emblemology from the ill-fated Scion brand, the all-new 2019 Toyota Corolla Hatch comes to showrooms with new styling, more power, more refinement and yes a lot more features. 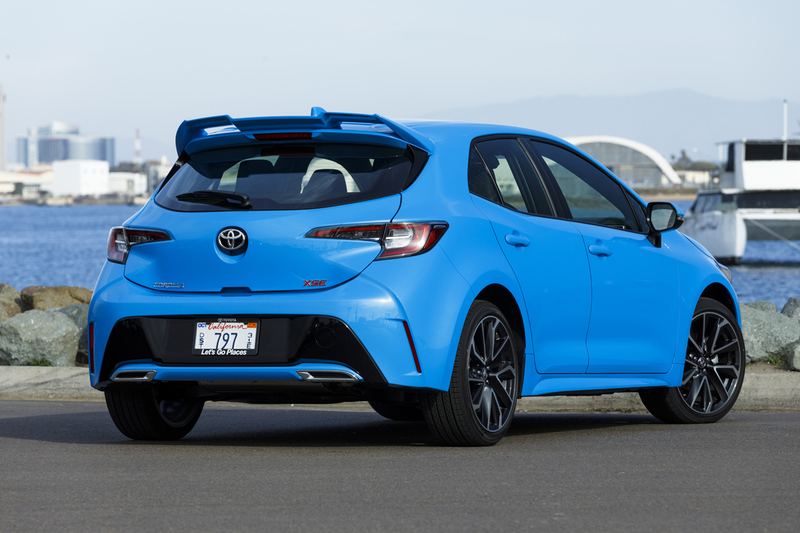 The 2019 Toyota Corolla Hatch comes on the all-new TGNA architecture, thus new from the ground up. Styling however is evolutionary from the last generation, unmistakably related. Fresh though it is, lower to the ground, wider, and just slightly shorter than before. 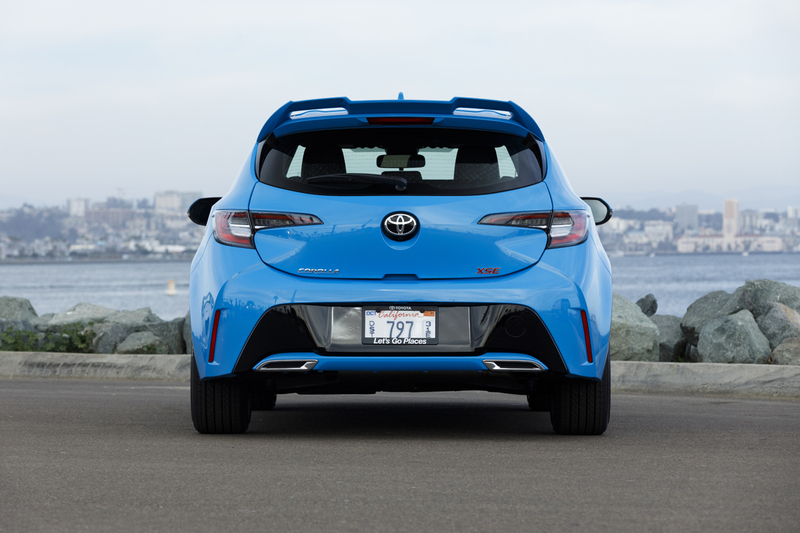 Its 1.5-inch longer wheelbase pushes the wheels further to the corners, accentuated by pronounced wheel arch flares. 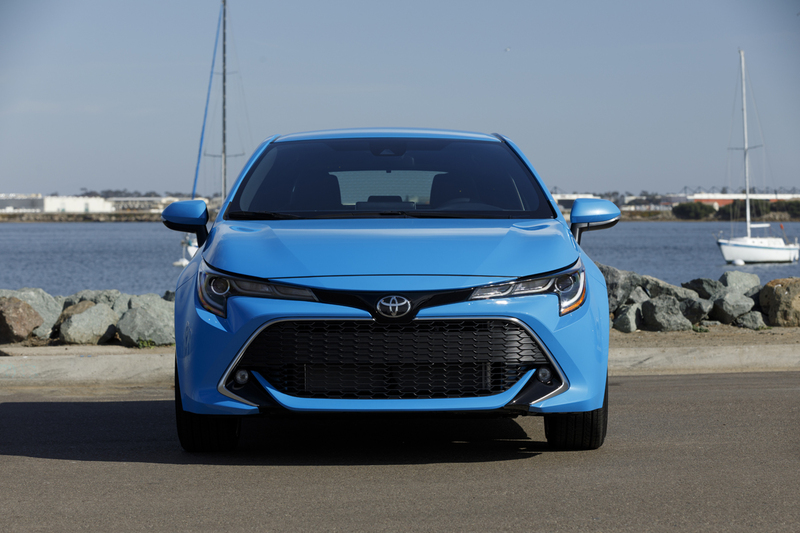 It gets an updated face of course, more of the modern Toyota look with aggression and bold forms. Coming in two trim grades only, a well equipped SE and the XSE, LED headlights are standard on all and LED foglights come on the upper trim grade. At the rear are standard LED tail lights along with an integrated roof spoiler also standard. 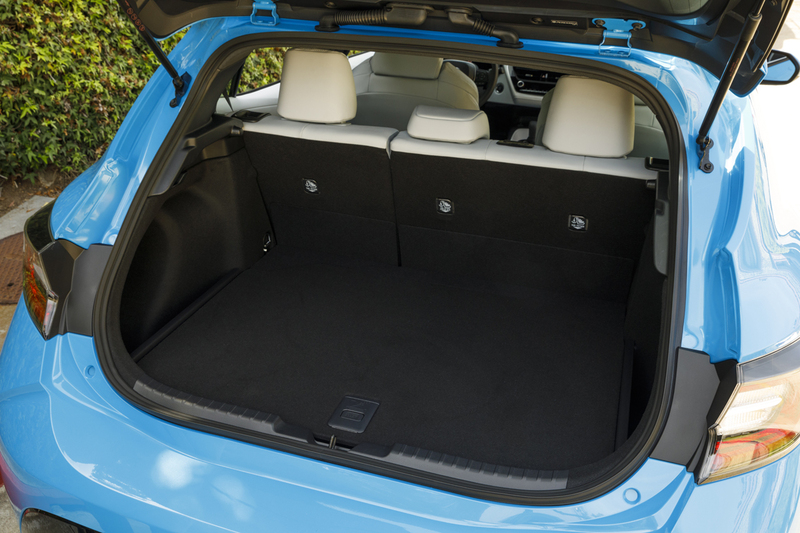 The rear hatch is made of plastic, Toyota says to save weight. Of note though, the handsome exhaust tips are also made of plastic, completely and utterly fake and non-functional, not connected to any plumbing whatsoever. Weight savings? Maybe but surely saves a few bucks too. Wheels are standard alloys, 16-inch on the SE and XSE gets the 18-inch units you see here. I like the looks of it quite a bit, but I have to admit I kind of liked the previous generation too – not one of the critics of Toyota’s bold new styling themes. 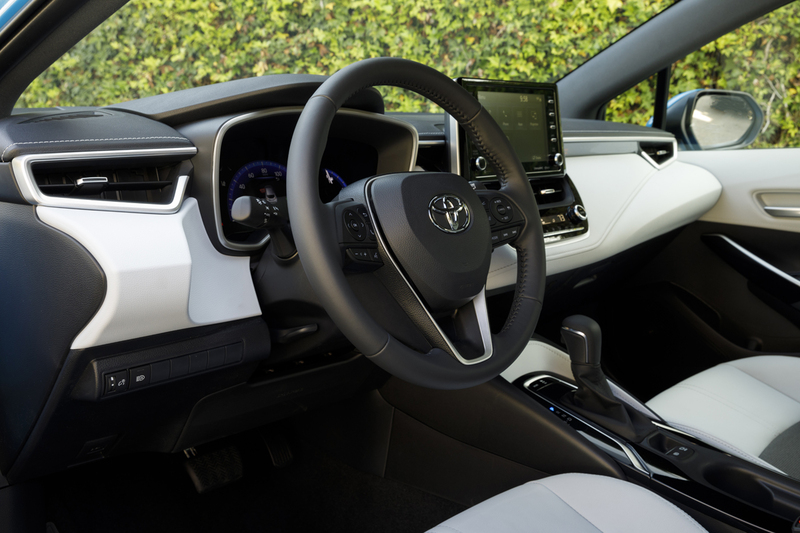 The interior gets a clean sheet of paper design with premium materials and dash that likely wont be seen when a new Corolla sedan arrives. Here we have a floating 8-inch center screen with Entune 3.0 standard with a wide array of upgrades available. Center console is located high up for a more cockpit like feel and the steering wheel comes with leather no matter which grade you get. 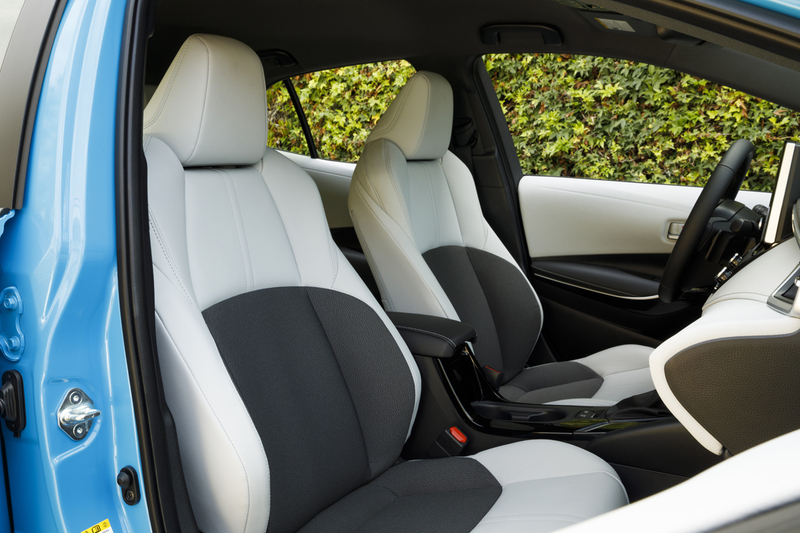 SE trims get cloth seats and the XSE gets a handsome leather and mesh cloth combination – not the SofTex fake leather we have been seeing. Nice. While it’s a comfortable place to be and play on back roads, the cabin is a little snug for larger people due to its design ovations. This is a sportier boutique model mind you. 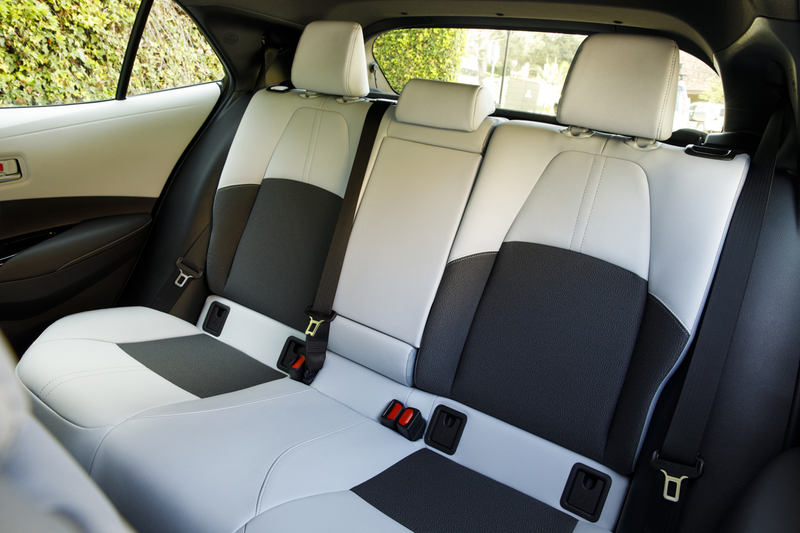 When a redesigned Corolla sedan arrives look for more breathing room than in here. 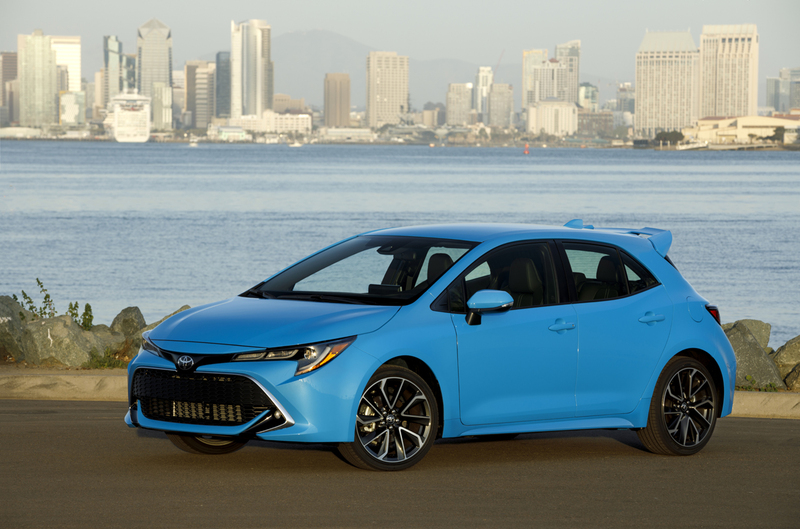 Powering the 2019 Corolla Hatch is an all-new direct-injected 168 horsepower 2.0-liter four-cylinder engine. With 151 pound-feet of torque it will be available with two new transmission choices regardless of trim grade. 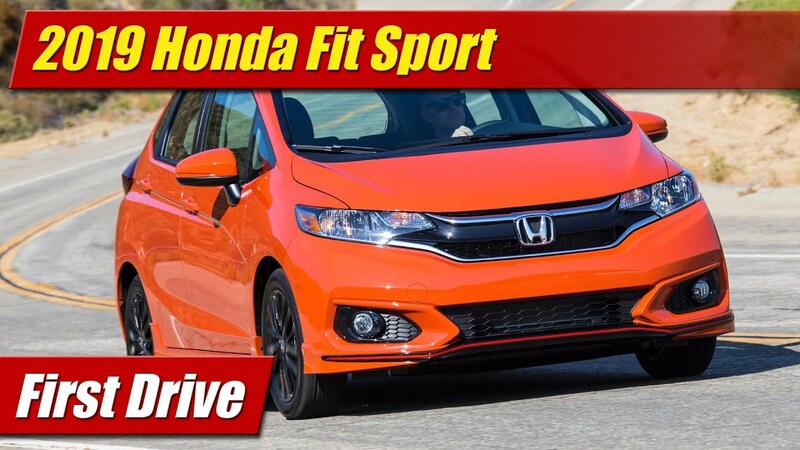 The first is an all-new continuously variable transmission (CVT) that features a conventional first gear for takeoff, then CVT pulleys and band for the rest of the range. This gives it a more positive feel starting off. 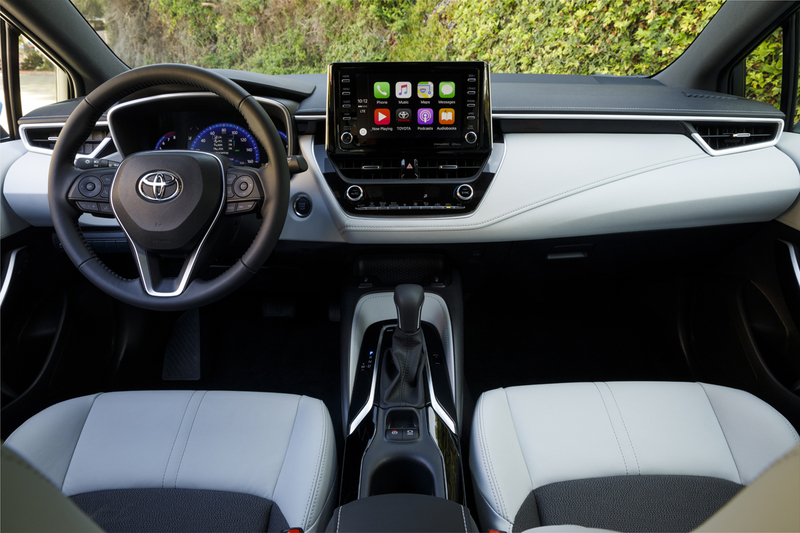 Once you’re on the go, it has a simulated 10-speed automatic feel combined with shift paddles. The other transmission is a 6-speed manual transmission they call iMT. The hardware is nothing new but it comes with software to automatically rev match the engine up or down. This softens shifts for those who aren’t as graceful at it and even helps on take off to assure proper throttle from a stop. Bottom line, it’s easier to drive for a novice. The new engine has a pleasant sound and feel with more refinement than one might expect from direct-injection. It’s extra power is certainly evident over the current model. With the CVT, the feel and performance is definitely better but it is still a CVT, even with the shift points and paddles it’s artificial in its feel. Shifting the manual transmission is indeed slicker with the iMT software designation. I even let the clutch out at a stop sight a few times without giving it gas and it took off without stalling or balking. Impressive. Also impressive is its handling. The last generation Corolla chassis was hard to call engaging in how it felt and responded to you. Here with the latest TNGA goodness that has transformed the Prius, Camry and more we have a car that feels alive and willing to play. It has nicely sized four-wheel disc brakes and a suspension that’s well tuned for both a decent ride and sharp reflexes. 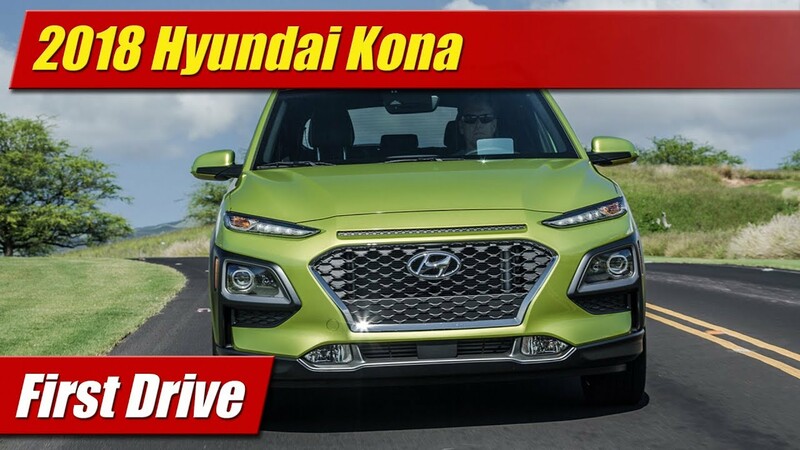 Steering feels light and engaging which is a big change, and the tires dig in predictably on bumpy curves courtesy of a multi-link rear suspension. Transitions from side to side with less body roll likely come by way of its lower center of gravity. On a windy back road, it’s actually something you’d call fun to drive. Granted this is no Golf GTI when it comes to handling and hardware under the hood but its miles more pleasing than before. In a market fast filling up with hotter five-door hatches this new Corolla fits nicely into the class of its peers. 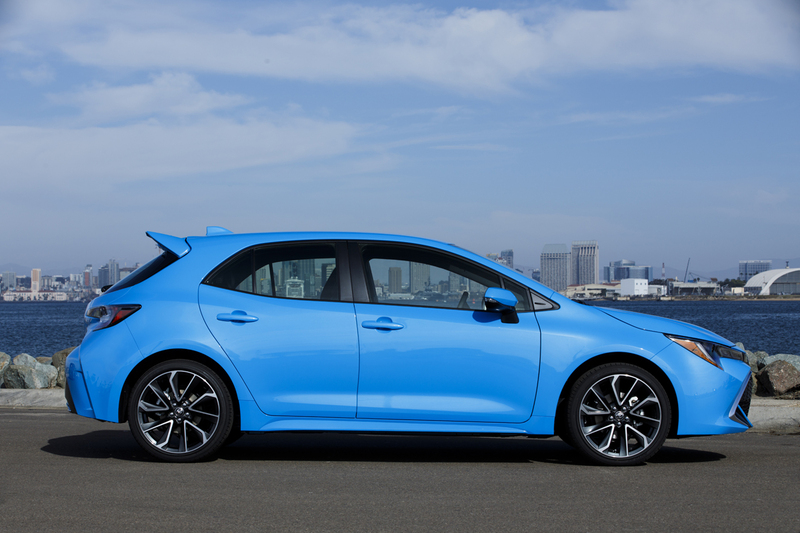 When the 2019 Toyota Corolla Hatch goes on sale it will start at $19,990 for the SE model with manual and $22,990 for the fully loaded XSE manual. Adding the CVT to both is an additional $2,100. Combined mpg will be in the mid thirties for most variations, the SE CVT being the mileage champ with as much as 42 mpg highway according to the EPA.